. . .I'm going back to that place." The man was clearly demented and must be humoured. "Well, you must wait till the morn's morning. It's very near dark now, and those are two ugly customers wandering about yonder. You'd better sleep the night on it." Mr. Heritage seemed to be persuaded. He suffered himself to be led up the now dusky slopes to the gate where the road from the village ended. He walked listlessly like a man engaged in painful reflection. Once only he broke the silence. "You heard the singing?" he asked. Dickson was a very poor hand at a lie. "I heard something," he admitted. "You heard a girl's voice singing?" "It sounded like that," was the admission. "But I'm thinking it might have been a seagull." "You're a fool," said the Poet rudely. 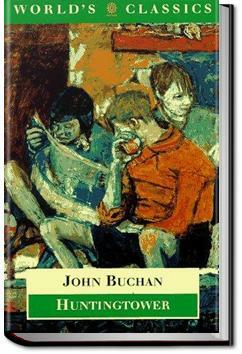 See my review to "Prester John" for more detail about the author, John Buchan. This review will also encompass the entire Dickson McCunn series, "Huntingtower," "Castle Gay," and "The House of the Four Winds." I really dig Buchan for some reason. Great adventure stories with tons of period details (he seems to know every general, battle, and politician of the era). And that's despite the ridiculously out-of-date imperialist, colonial-era biases and stereotypes that he is mired in. One of the best books I've read this year. I didn't think Buchan was capable of writing a bad book, but this comes pretty close: preposterous, vague backstory, and tediously overwrought intrigue suspense make for a boy's own adventure fit only for the dimmest of lads. I gave up on this at 30%. It's a strange little book.